Hi there! We’re Doug and Cheri Safford We are the proprietors of Red Sky Trading in Glover,Vermont. ( located in the village,on Route 16). 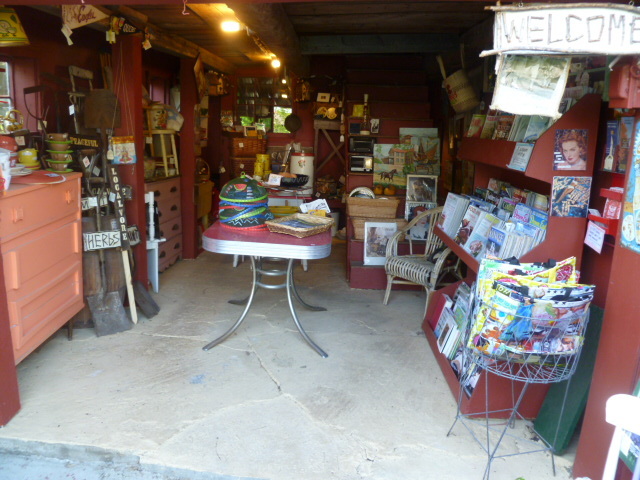 Along with our cocker spaniels, Zelda and Phinneaus and a flock of happy and spoiled hens and 7 Zebra finches,, We offer patrons a unique and nostalgic shopping experience. We are a seasonal business, open May to October..(longer if weather permits. )It is always best to call for hours in the fall season. Nestled in an Historic Barn on our property along the Barton River. We offer up kitschy collectibles and just plain fun,stuff. Good eats too! A sweet or a fast lunch.All self serve and on the honor system..unless we are about to lend a hand. Local Artisan cheeses, including selections from The Cellars at Jasper Hill and Sweet Rowen Farmstead,Blue Ledge farm,”Olli” Salume in lots of amazing flavor profiles. Fresh Patchwork Farm Bakery bread (every Friday after 2pm) baked by our friend Charlie Emers in East Hardwick, our own homemade jams..(Doug has won many ribbons at the fair! 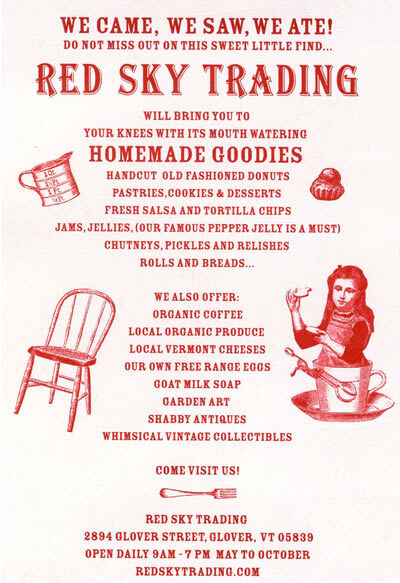 ), jellies, chutneys and pickles as well as, Summer lemon squares,and lots of other tasty desserts ,cookies,and pastries.. Organic fair trade coffee, too.Our delicious Homemade hand-cut donuts are a definite specialty! !..and dare we say,worth the trip. Come ponder in an Adirondack chair on the river, say hi..(if you can find us..)and slow down a bit.Life is fast.